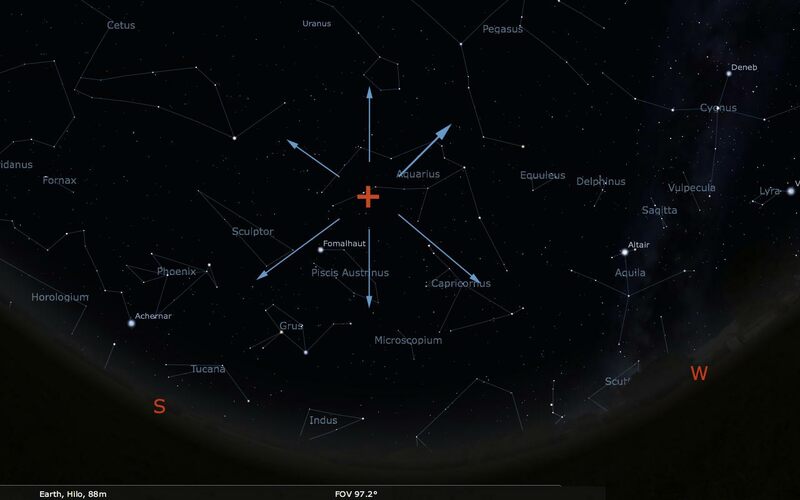 Coming Friday will be your best shot this year to see shooting stars burn in the Hawaiian night sky as the Delta Aquarids meteor shower reaches it peak. Meteor showers occur as Earth plows through the trail of debris that is left in the wake of a comet. Because our planet moves with the incredible speed of 90,000 miles/hour, all swept up particles quickly burn up in the atmosphere as a shooting star. Normally the mid-August Perseid meteor shower steals the show with on average up to 60 shooting stars per hour during its peak. This year however, the full moon will outshine all but the brightest of the Perseid Meteors, which forces those of us with a long wish list to turn to another shower. Luckily, the Delta Aquarid meteor shower is a worthy contender. It may not be as active as the Perseids, but the peak of the Delta Aquarids coincides with the new moon coming Friday, July 29. On top of that you will also be able to see the first of the Perseid meteors as the shower slowly starts building up to its (poorly visible) peak Aug. 13. The combination of these two showers with the new moon make Friday the best night of 2011 to watch shooting stars. Expect to see up to 15-30 shooting stars per hour against a clear and dark sky. Comfortable meteor watching is best done with a reclining chair or a blanket to lie down on, because you will be looking up for a long time. Bring a pillow for your neck and find an as dark spot as possible. Once installed sit back, relax, and allow 15 minutes for your eyes to adapt to the darkness. 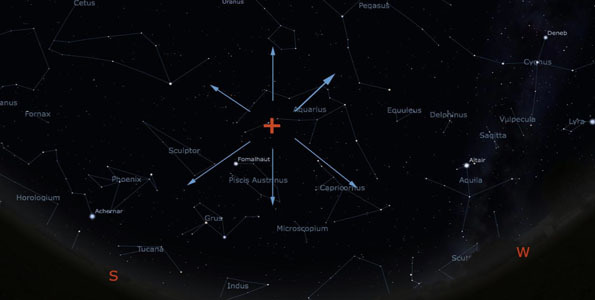 As with all meteor showers, the best time to view is the early hours before dawn. Peak: Nights of Aug. 12-13 and of Aug. 13-14; the shower is active from July 23 – Aug. 22. The most famous meteor shower, with up to 80 per hour. Significant interference from the moon on both nights; it’s nearly full on night of Aug. 12-13 and is full Aug. 13-14. Peak: Night of Oct. 21-22. Stay up late Oct. 21 and into the early hours of Oct. 22. Active period: Oct. 15-25. A modest shower, also caused by debris from Halley’s Comet. Up to twenty meteors per hour, but this is an irregular shower. Interference from waning crescent moon from 1:30 a.m. Oct. 22. Peak: Night of Nov. 17-18. Stay up late Nov. 17 into the morning of the 18th. Active period is Nov. 13 – 20. The Leonids have an intense peak every 33 years and were responsible for the greatest meteor shower over Hawaii in recent times, the 2001 shower. Things are not as spectacular here in 2011, the 10th anniversary of that amazing 2001 shower. Still, you can still look for up to 10 per hour. There will be someinterference from a last quarter moon on the peak night (night of Nov. 17-18). Peak: Night of Dec. 13-14 (i.e. stay up late Dec. 13). Active period: Dec. 6 – 19. One of the best showers; and we in Hawaii often have good weather in December to see it. The waning gibbous moon will be an issue, as it’s the sky during the entire peak period. Up to 60 meteors per hour. This meteor shower is a rarity in that it is caused by debris from an asteroid (3200 Phaethon) rather than by comet debris, as is the case for all other meteor showers listed here.